That car was burning. Are there any questions? It rested on its roof, flipped. thoughts over the pavement. Hello? the air. The radio glowed like my heart, and it sang like my heart. Even now, the man inside tries not to sleep. Anyone? queer flower blooms best at night. I saw the whole thing. Here I am. Up here. heart flashing over the houses. gather around me, you won't ask me any questions at all. 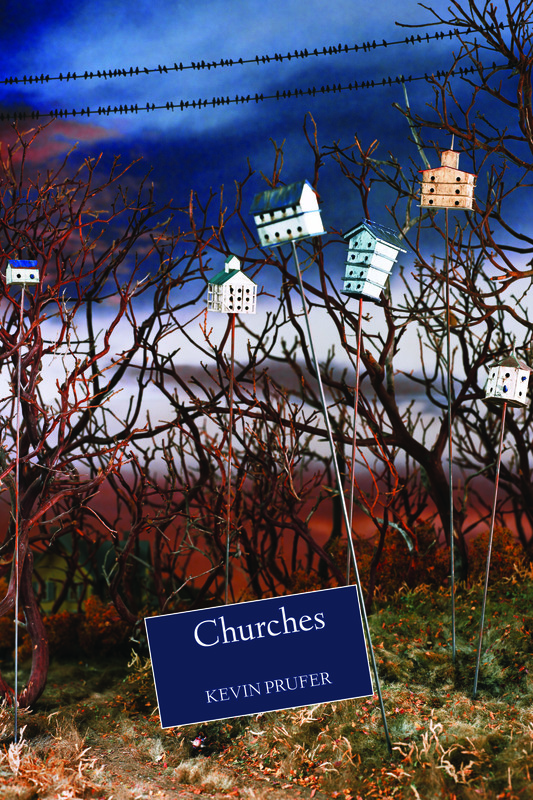 “Churches (Four Way Books, 2014) is a collection that dazzles with sound and macabre landscapes where anything is possible….Prufer is a poet that you can trust with your mind. He may bring you to the reaches of subjective reality but you always return somehow more whole and with a greater understanding of the human conditions of suffering, grief, love, and fear.” Read the full review. "Prufer (In a Beautiful Country) suffuses a landscape of strange, near-apocalyptic Americana with off-kilter religiosity and consciousness of mortality, featuring statesmen, children, lovers, a dying father, and the scepter-like presence of a young daughter." Read the full review. "Many of the poems in Churches, by Kevin Prufer, are full of fire, smoke, and broken glass. Their speakers often find themselves in a world figured as a womb of violence, forced to face—without the solace of religious abstraction, and often under the harshest of conditions—human mortality. Out of these wombs is born, for the reader, a necessity to contemplate the role of faith in our attempts to survive and understand the harm done to us by circumstances, or by others, but also to consider that the harms we suffer are often of our own doing. These poems frequently illustrate the failure of the coping mechanisms that we have come to rely upon in a post-Nietzschean world where religious faith is either absent, or, even worse, destructive." Read the full review. "The poems in Churches are composed of materials that, in lesser hands, could become prescriptive and moralizing. But what makes these poems so ephemeral and tough is the way Prufer lets his stories and subjects speak for themselves, eluding any attempt we might make to reduce them to their constituent parts.” Read the full review. “Kevin Prufer’s sixth book, Churches, weaves narratives past and present into graceful, sprawling poems. Most poems in the book, such as the first one, ‘Potential Energy is Stored Energy,’ use a split narrative structure. In that poem, the heat of bomb in train is juxtaposed with the heat of a fever in a baby. It is a powerful device and Prufer puts it to good use in the collection." Read the full review.